Wing’s drones are still subject to more noise assessments before full approval to operate commercially is granted. Photo: Wing. It appears claims that a world-first drone delivery service had been launched in Canberra was more noise than substance. 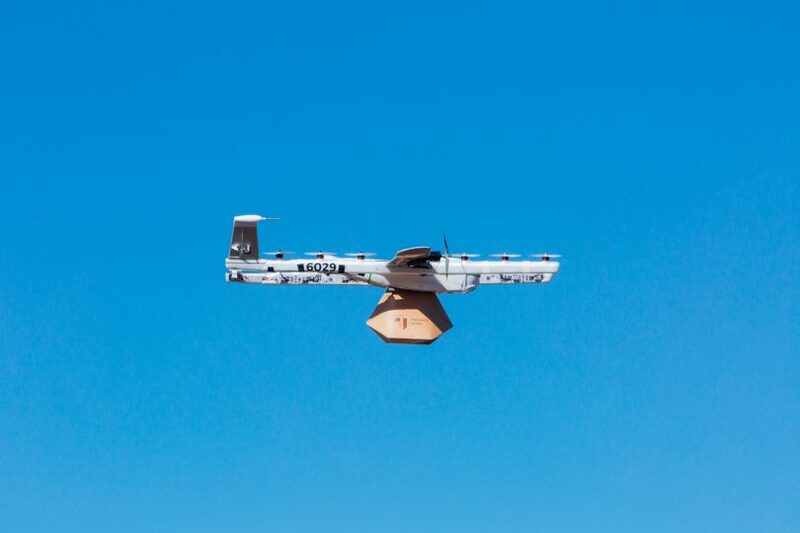 Alphabet subsidiary Wing had announced earlier this month that it had received approval from the Civil Aviation Safety Authority to fly its drones from its Mitchell base to three Gungahlin suburbs, to start its commercial operations in Canberra’s north. A condition was that it use its quieter drones, developed after the public backlash during the Bonython trial, in Canberra’s south, which prompted an Assembly inquiry that won’t report until late in the year. But community lobby group NoDrones.Zone has received advice from the Department of Infrastructure, Transport and Regional Development that the approval required for full commercial operations of Wing’s drone deliveries in Canberra’s north has still not been issued and remains dependent on further noise assessments. Spokesperson Jon Reynolds says drone opponents have always argued that Wing was conducting flights illegally, without the required approvals related to aircraft noise. Deputy Secretary Pip Spence confirms in a letter to Mr Reynolds that Wing was granted approval only for ‘community demonstration flights for the period 11-13 April to a specific location in Crace, Palmerston and Franklin under the Air Navigation (Aircraft Noise) Regulations 2018’ and that more measurements of drone noise will need to be taken. Ms Spence says feedback from these flights will be part of ongoing consideration of Wing’s future planned operations in Canberra under the noise regulations. “We appreciate that there are both supporters of drones operating in the way Wing is proposing, and also those who will be more cautious, including in relation to noise impacts. That is why we are taking an incremental approach, and in the first instance provided an approval for the three demonstration flights,” she says. Mr Reynolds says former Australian aviation regulator Ian McIntyre has correctly asserted that Wing’s Australian operations have been illegal since they began operations in 2014, as there had been a failure to obtain the appropriate noise approvals under the Air Navigation – Aircraft Noise Regulations 2018. It appears the issue of noise approvals has fallen through the regulatory cracks. Mr McIntyre says there are penalties for flying an aircraft without noise approvals and asks which agency is going to pursue the matter? Mr Reynolds says Wing has been continually stating on the public record that they have been fully compliant with Australian aviation regulations, yet when challenged through the Australian regulator it appears to confirm that they have been operating illegally. “Wing desperately want to give the impression that noise from their drones is not an issue and this is clearly not the case,” he said. Mr Reynolds said that CASA could not deal with noise issues and approval needed to come from higher up in the department. “There is a legal process that Wing has to meet, and while they still don’t have approval to operate commercially they’re still in their trial phase,” he said. Mr Reynolds said the group wanted to ensure that Wing’s drones were not going to have a detrimental impact on residential amenity, and if it could not do that it should abandon its plans. Under the Aircraft Noise Regulations, the engagement of an aircraft in air navigation that has had and is likely to have a significant noise impact on the public are clear grounds for revocation of approval to operate, he said. Wing said in a statement that it operated with all required approvals. “We hosted three delivery demonstration sessions in Crace, Palmerston and Franklin for the community to experience drone deliveries in person, ask questions, register their interest in our service, and share their feedback with us,” the statement said. I'm looking forward to a ban on single use plastic items...such as coffee cups. Even cardboard looking ones have plastic inserts. How will that effect coffee delivery by drone 😁. Hate drones, then support the ban on single use plastic items. Looks like a Cold War bomber. A lot of effort for a coffee and Burrito. What about the cost? Do we need more reason to spend time indoors? We are becoming socially inept! It has been planned for months. Was requested to work on this project sadly it had had set backs. It's a shame when innovative comes knocking that the door is shut. Not all that is innovative is worthwhile. The 3 demo sessions were at very short notice with low level publicity. Hardly a fair opportunity for people to hear and see the drones in operation. Shayne Borger home delivery is already a thing. drones have the potential to reduce the environmental impact and cost of home delivery, taking cars off the road, and closing underpaid gig economy jobs down which is good for workers. I'm surprised you've bought into this privacy idea when you have a Facebook account and a smartphone Shane. These companies aren't going to care one bit about what you do in your backyards. They just want to provide a service and disrupt the market which is good for all of us.